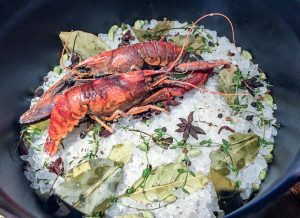 Since renowned chef Andre Chiang closed down his eponymous restaurant in Singapore earlier this year, the focus has shifted to Taiwan and his ‘casual’ eatery, Raw Taipei. It’s a seriously tricky reservation to get. Greedy Girl got online the moment bookings opened for the four days we had in Taipei but got an immediate rejection, saying all tables were already booked. And therein lies one of the problems. You can only put in a day and an alternate on the booking form. Attempts to also book for a different day are blocked, given you already have a request in the system. 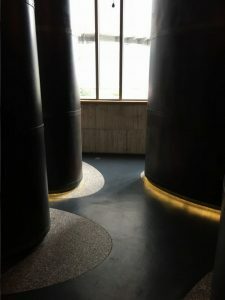 But the rejection actually opened the door a crack – responding to that email, Greedy Girl got a chance to alert the restaurant to the days of our visit and make a heartfelt plea for any available time, lunch or dinner. The Gods were smiling. The original request opened up a few days later and we jealously guarded our spot. 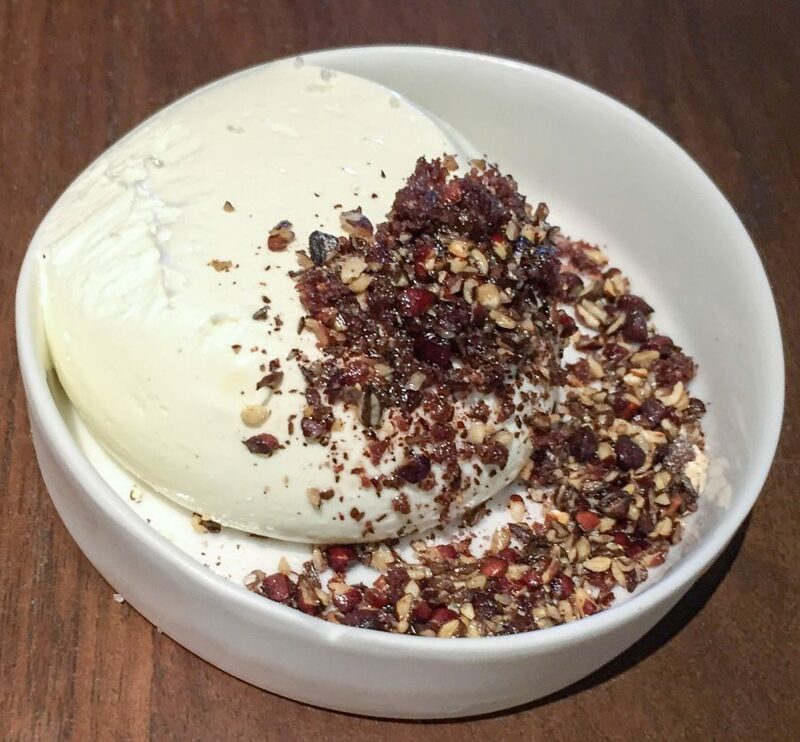 Raw is a joint venture between Chiang (originally from Taiwan) and fellow chefs Zor Tan and Alain Huang. 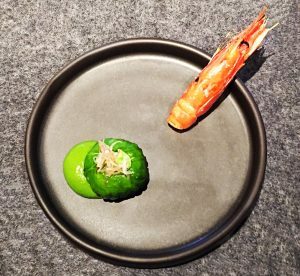 It’s the highest-ranked Taiwan restaurant on the San Pellegrino World’s 50 Best Restaurants and has one Michelin star (so far) from Taiwan’s inaugural awards list. We’ve long been fans of Chiang’s food from his days at Jaan and Restaurant Andre. Such is the hype around Raw that available tables last, it’s said, for just three seconds on the online interface when bookings open. Greedy Girl is counting her lucky stars that there was a cancellation. So we walked the very short distance from the Taipei Marriott to 301 LeQun 3rd Road in the Zhongshan district, to present ourselves for an 11.30am lunch. The restaurant is shielded from prying eyes by blinds until it opens on the dot of 11.30. If you’re travelling from more far flung places in Taipei, be warned there’s nowhere to wait if you arrive ahead of schedule. The interior is very dramatic, with soaring wooden sculptures opening to a large dining room with a partially-open kitchen at the far end. We are shown to a table for two towards the back of the room. We’d already pre-booked the most expensive menu at NTD$2680 (about A$120 on current exchange rates). That gave us nine courses. 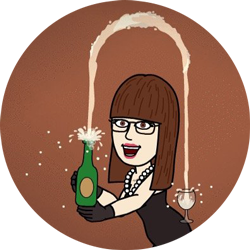 Ordering a bottle of extra-brut Metisse noirs et blancs champagne, it wasn’t long before our first course arrived. Our waitress Sandy spoke reasonable English, although her pronunciation of some ingredients left us scratching our heads from time to time. There is the opportunity to rule out ingredients ahead of time, but generally the meal is as the kitchen prepares it on the day. The menu descriptions are also very economic. 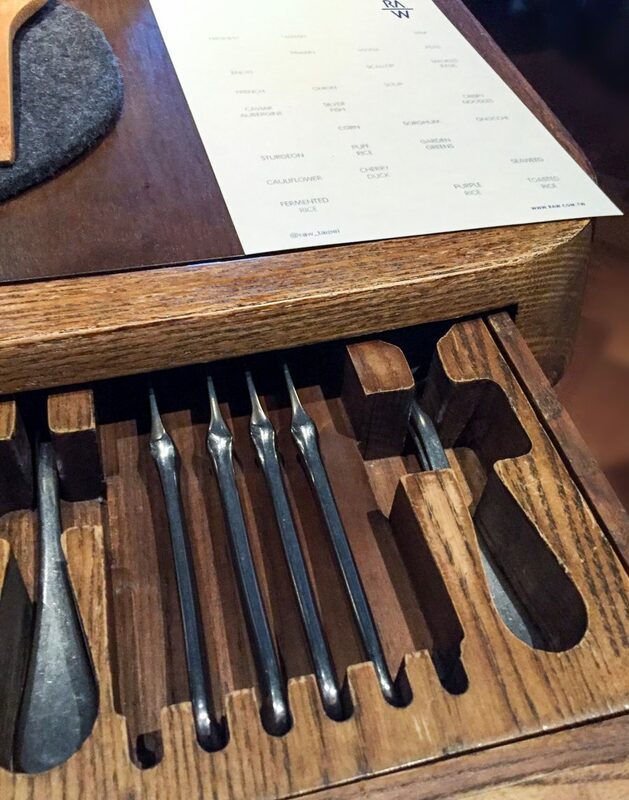 Apart from our final savoury course, we were directed to take cutlery from a hidden draw in the table. Another quirky but entertaining touch. First up was ‘Freshest Taiwan milk’. 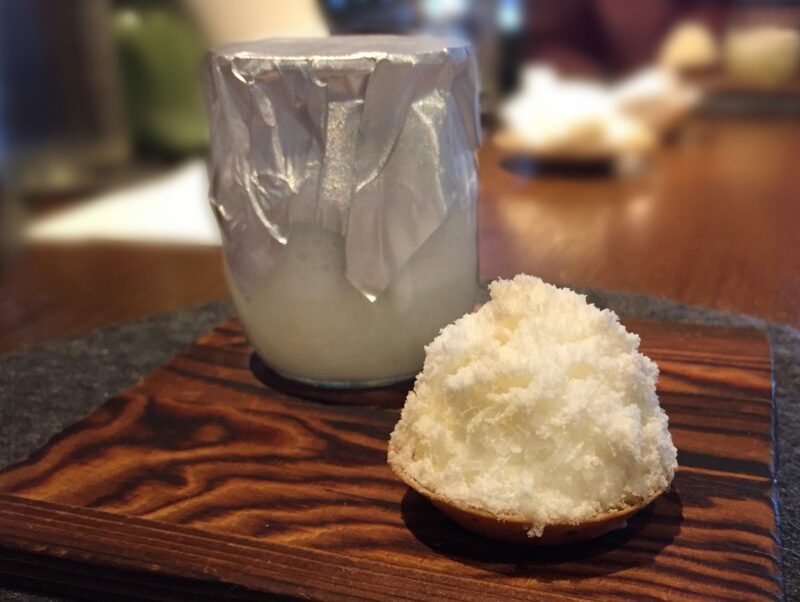 This was five textures of Taiwan milk, in varying temperatures and forms, but was essentially a whey drink with a small, tangy tart on the side. The drink tasted quite nutty to begin with and Greedy Girl freely admits it wasn’t hugely her thing, but the tart was delicious. All good. 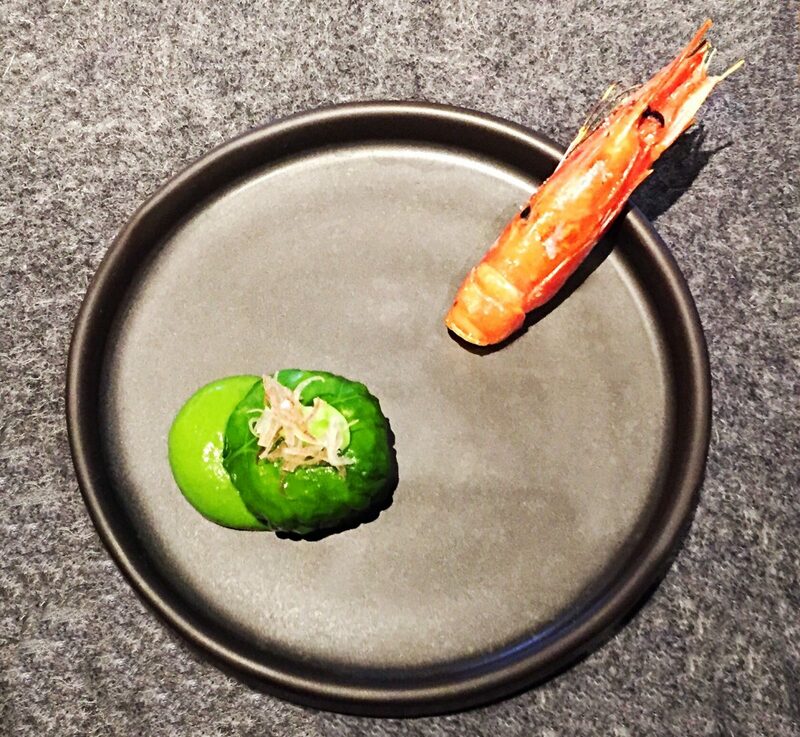 Next was ‘Prawn, Mioga (a Japanese ginger), Peas’. 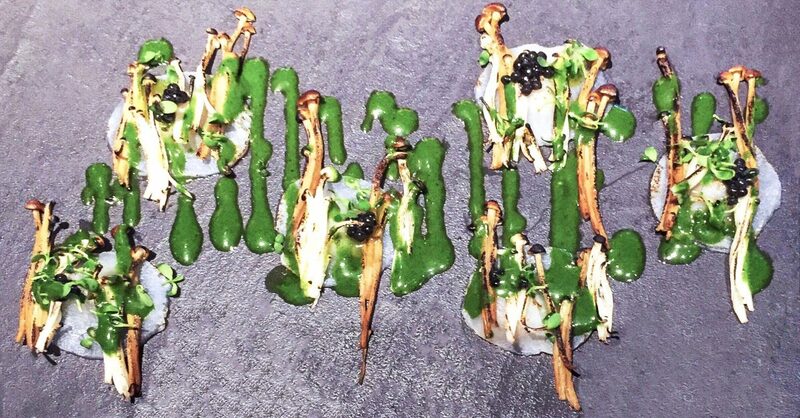 A prawn was charcoal grilled (although Greedy Girl didn’t enjoy eating the shell) but the hero of the dish was a little nigiri ball featuring the prawn atop a pea sludge that we were then invited to dip into a dish of crunchy quinoa. Delish. 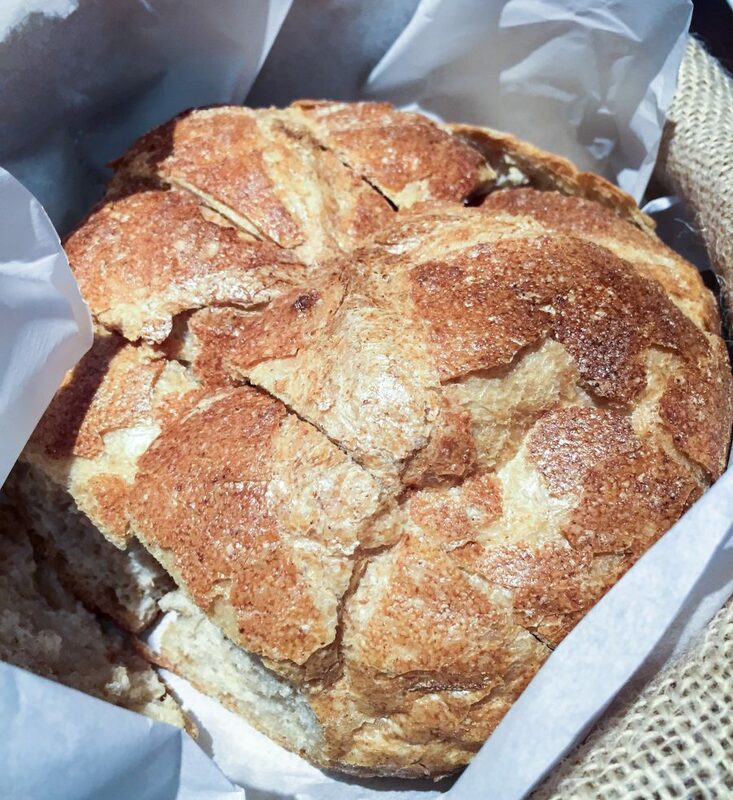 Bread was then brought to the table in a hessian sack, paired with butter topped with roasted buckwheat. 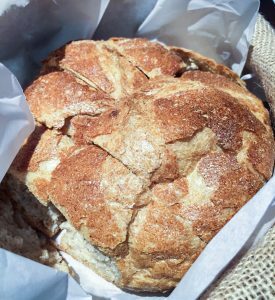 The bread itself was OK but came into its own with the ability to mop up remnants on the dishes to come. It was put to good use in a very pretty dish of golden and white enoki mushrooms with sashimi scallop, atop a crunchy little crouton. 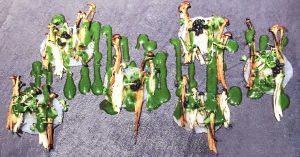 The dish was finished with a smoked basil sauce. OMG. This was seriously good. The wait staff had earlier thwarted Greedy Girl’s intention to hoover up the rest of the quinoa from the prawn dish and this basil sauce wasn’t getting away. Our next course was French onion soup, pictured at the top of this post. A delightful golden orb appeared in a bowl and the wait staff proceeded to use a microplaner to grate a dark mini-baguette over the top (in lieu of croutons). Most of the crumbs seemed to fly everywhere but the dish but it was a little piece of theatre. The dish itself wasn’t soup – it was an orgasmic French onion cream and, where the moisture hadn’t softened the shell, the orb also had a satisfying crunch. Every last skerrick of this went and the bowl went back to the kitchen as clean as it could be. Next was a piece of fun. 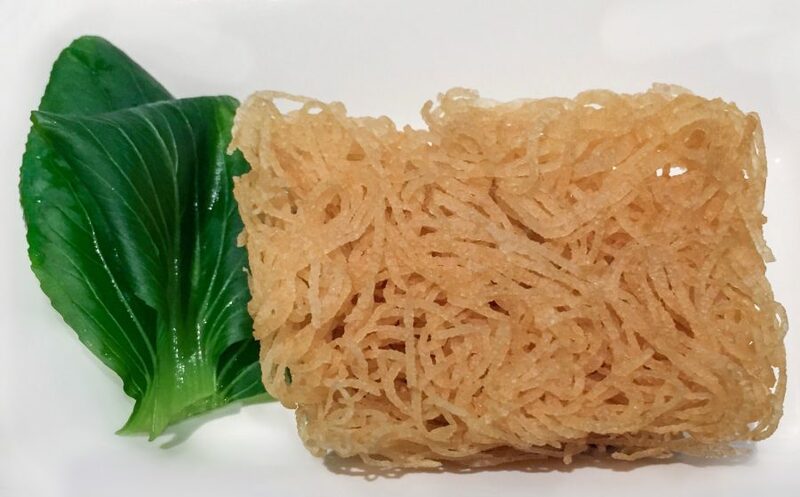 Caviar aubergine combined with ‘silver fish’ and crispy noodles. 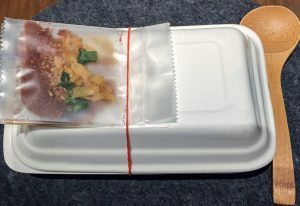 A ceramic version of the (thankfully less over time) ubiquitous polystyrene take-out box was placed before us. Apparently the shape and style is a Taiwanese bento box. Held on by a rubber band were three plastic flavour sachets – dried vegetables, a little spicy powder and a chicken stock/sesame oil-based sauce. Opening the box, we were presented with the crispy noodles on top of a bed of the aubergine caviar. We were instructed to mix in as much of the three sachets as we’d like. The noodles were actually potato. Separately the ‘silver fish’ were presented in a huge cast iron pot, before one was placed before us each on the top side of the box. They were large shrimp, or as close to a yabby Greedy Girl has seen in recent times, coated in rock salt. Gluttonous husband to the rescue here, using his peeling skills to great effect. There’s a lot of food happening here and we were getting rather full. Next up was described as ‘corn, sorghum and gnocchi’. This extraordinary dish had local corn sliced as thin as paper over the top of potato gnocchi, a very runny egg (cooked sous vide we presume) and fava or broad beans. 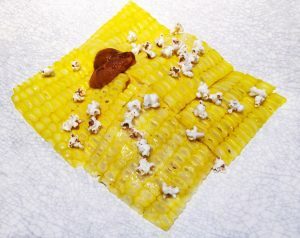 On top was a quenelle of uni (sea urchin) and dots of popcorn made from sorghum. Again, this was absolutely delicious. The uni mixed through with the runny egg and made a terrific sauce. 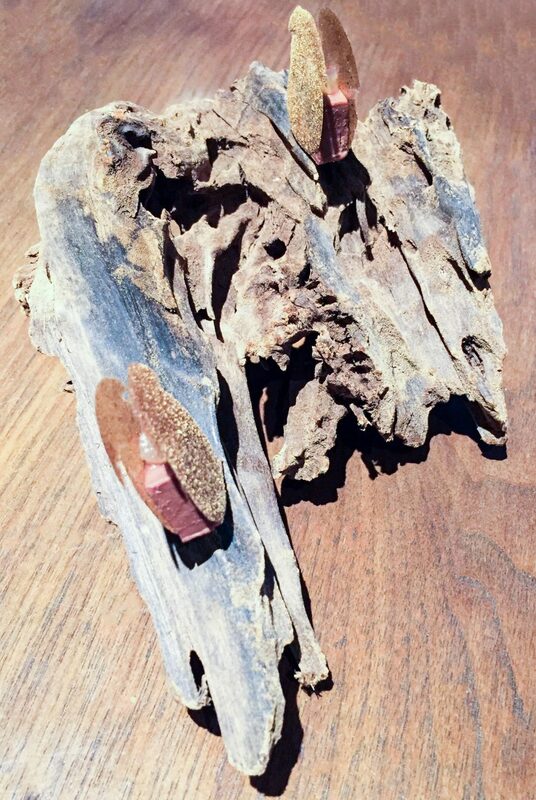 A very clever, very impressive dish. Next we had sturgeon, with puffed rice and garden greens. 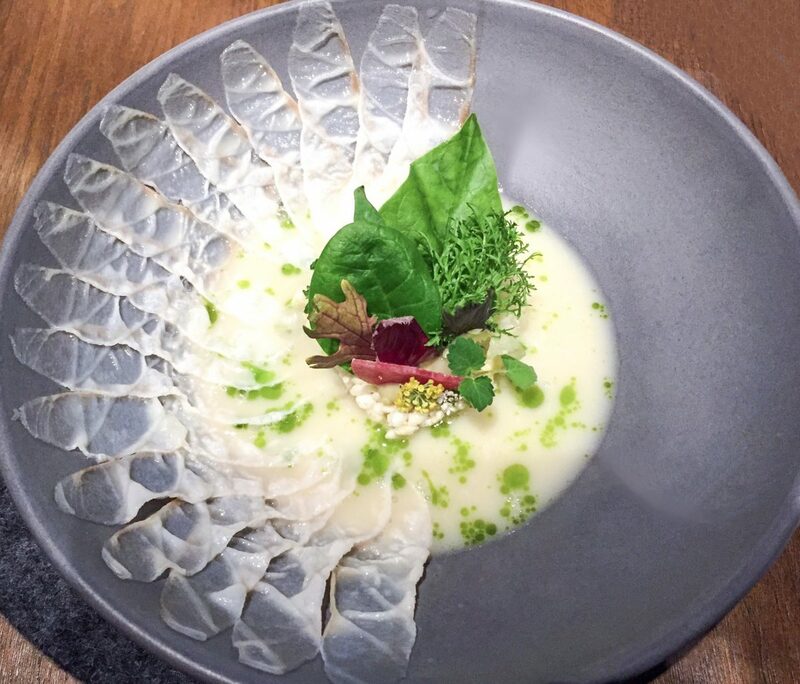 The fish is presented raw, sliced incredibly thinly and delicately placed around one side of the bowl. A hot broth is poured over the top and we were directed to mix it together, shabu-shabu style. Greedy Girl isn’t the biggest fan of sturgeon, finding it very strong, but this was utterly sublime. Wow. 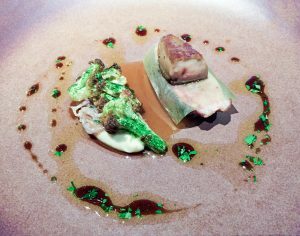 Our final savoury course was cherry duck, cauliflower and seaweed. 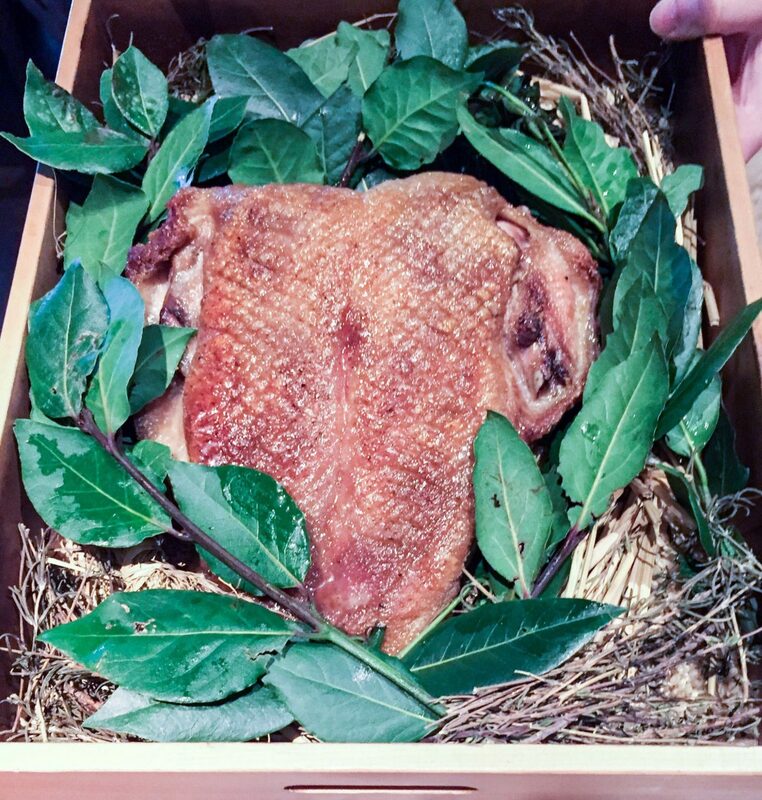 The duck is presented first for diners to ooh and aah … and we did so, right on cue. 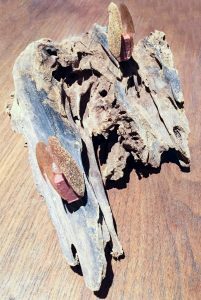 It’s then plated with some cherry oil around the edge and topped with white kombu and a nugget of foie gras. The cauliflower is presented with a slick of potato and is quite firm, offering a different texture. The duck and foie gras were delicious but Greedy Girl didn’t warm at all to the cherry oil, leaving it on the plate. In a menu dominated by fish and vegetables it was nice to finish with some meat but Greedy Girl was already groaning about her full belly. But of course, no-one listened and, without much further delay, the dessert was brought to the table – a celebration of rice. 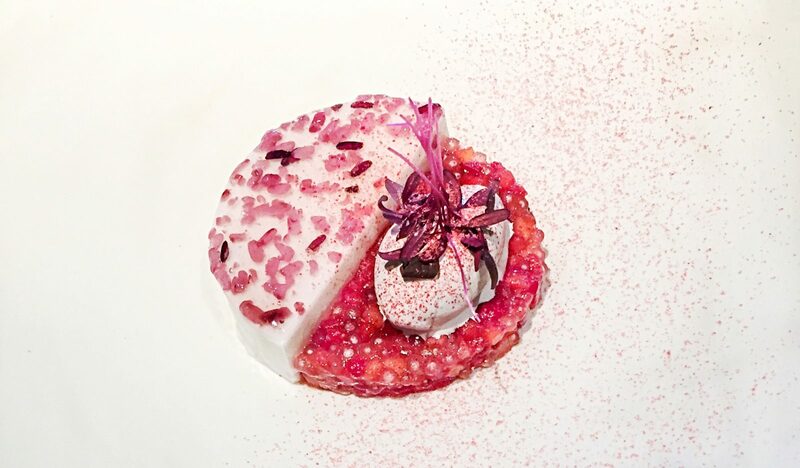 Strawberry infused pearls with a rice pudding ‘pannacotta’. On top was an ice-cream also made of rice. That was a step too far for gluttonous husband. He didn’t enjoy that at all. The dessert overall was light, not overly sweet and a good way to finish. We opted not to have coffee, so the petits fours were brought immediately – shaped like a mushroom, they were little chocolatey sandwiches. Yum. There was a surprise to come, though. 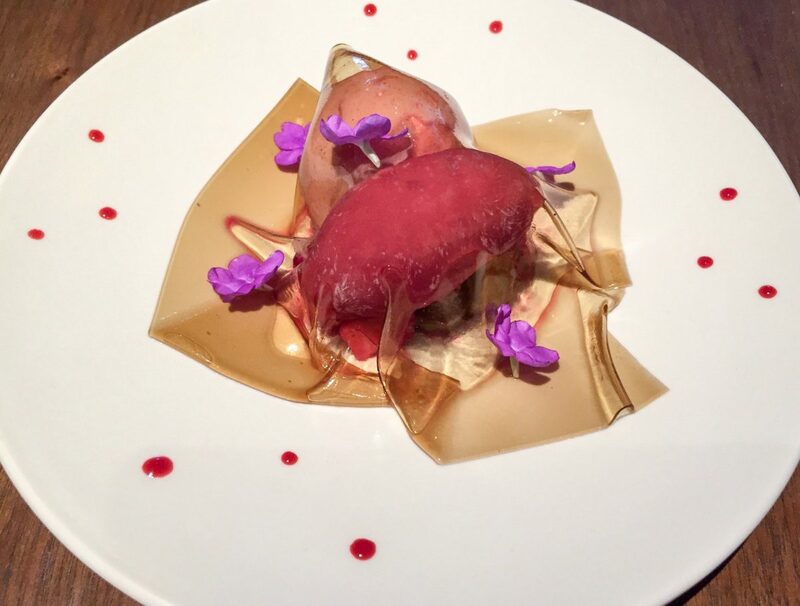 In honour of Greedy Girl’s birthday tour (see the post from Hong Kong’s Caprice for the start of that), an extra dessert was provided, featuring hibiscus and herbal tea jelly. Lovely and done. Raw opened in 2014 and its concept is ‘bistronomy’ – inspired by great Parisian bistro classics combined with the best in Taiwanese produce and some extraordinary cooking techniques. 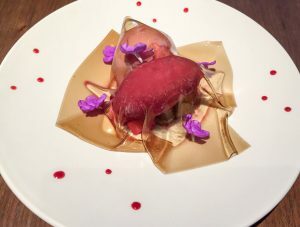 It was reported that chef Chiang didn’t want to be included in the Michelin guide, fearing distractions from the restaurant’s mission but that request wasn’t honoured by the inspectors. During the day it was a light and bright place to sit. At night it would be undoubtedly more atmospheric. The space is dominated by the huge, sculptural pine bars and a quirky light installation on a wall. Don’t miss heading into the restrooms – there are few Greedy Girl has seen that are as glamorous as this. In terms of getting a reservation? Well, we just got lucky. If you have more than one email address, you could try to put forward a separate booking request as the system doesn’t allow multiple requests from the same email. This is in a less touristy part of the city, but it’s an easy commute if you’re staying down near, say, the Taipei 101 tower. We feel it was worth the plane ride to Taipei alone.